Watch astronauts put a waterproof camera inside a ball of water in microgravity. Astronauts on the International Space Station are the “focus” of some of the first 3-D camera footage posted to a new playlist of 3-D videos on the agency’s official YouTube channel. The new gallery includes a tour of the space station and astronauts exploring water surface tension in microgravity with both the 3-D camera and a miniature HD camera in a waterproof case inside a volleyball-sized water bubble. Standard two-dimensional versions of both the tour video and the water surface tension video are also available. Meanwhile, the homebound Expedition 40/41 trio of Soyuz Commander Max Suraev and Flight Engineers Reid Wiseman and Alexander Gerst spent Thursday morning reviewing their Soyuz undocking and descent activities ahead of their Nov. 9 landing in Kazakhstan. Their orbiting Expedition 41/42 crewmates Flight Engineers Barry Wilmore, Alexander Samokutyaev and Elena Serova practiced emergency communication and coordination tasks. At the Gagarin Cosmonaut Training Center in Star City, Russia, the Expedition 42/43 crew’s Terry Virts of NASA, Anton Shkaplerov of the Russian Federal Space Agency (Roscosmos) and Samantha Cristoforetti of the European Space Agency are making final preparations for launch Nov. 23 from the Baikonur Cosmodrome in Kazakhstan on a Soyuz spacecraft that will deliver them for a 5 ½ month mission on the International Space Station. 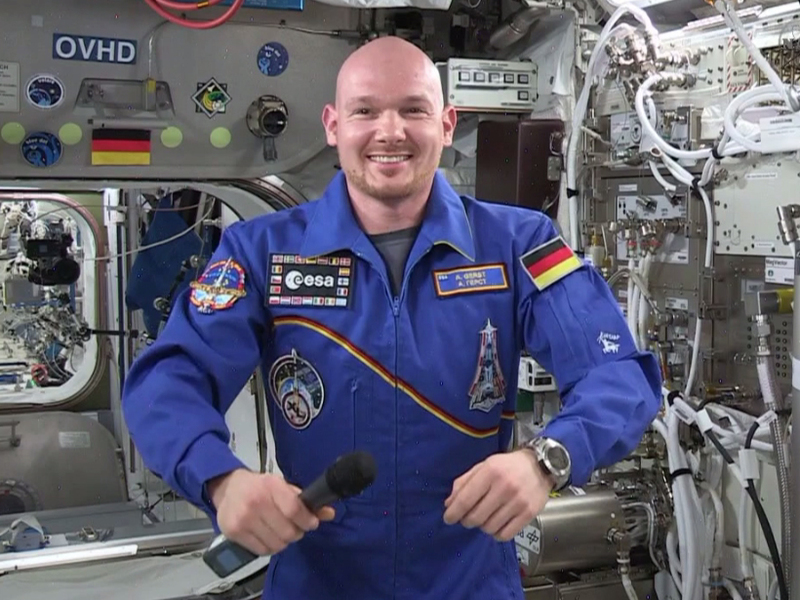 And for the latest roundup of information on the space station, watch the latest edition of Space to Ground. 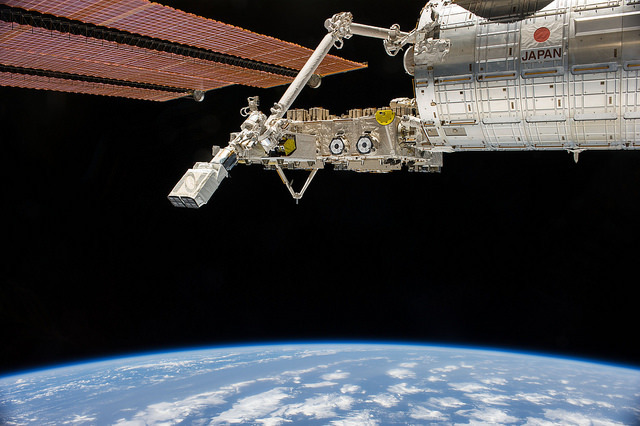 ISS040-E-103506 (19 Aug. 2014) — In the grasp of the Japanese robotic arm, the CubeSat deployer is about to release a pair of NanoRacks CubeSat miniature satellites. The Planet Labs Dove satellites that were carried to the International Space Station aboard the Orbital Sciences Cygnus commercial cargo craft are being deployed between Aug. 19 and Aug. 25. The station’s Kibo laboratory is at top right. A blue and white part of Earth and the blackness of space provide the backdrop for the scene. NASA astronaut Barry Wilmore worked throughout Tuesday inside Japan’s Kibo laboratory to remove a Cubesat deployer from the laboratory’s airlock. The deployer experienced problems in August, when some of the mini satellites did not deploy as expected and later deployed spontaneously. Wilmore’s Expedition 41/42 crewmates Elena Serova and Alexander Samokutyaev worked throughout the day on maintenance and a variety of Russian physical and medical science experiments. The homebound Expedition 40/41 trio, consisting of Soyuz Commander Max Suraev and Flight Engineers Alexander Gerst and Reid Wiseman, is counting down to its Nov. 9 departure inside the Soyuz TMA-13M spacecraft. They are packing gear to be returned home while they continue science and maintenance on the U.S. side of the International Space Station. Back on Earth, the new Expedition 42/43 crew is getting ready for its launch to the space station from the Baikonur Cosmodrome in Kazakhstan on Nov. 23. Soyuz Commander Anton Shkaplerov will be joined by NASA astronaut Terry Virts and European Space Agency astronaut Samantha Cristoforetti aboard a Soyuz TMA-15M spacecraft to begin a 5-1/2 month mission aboard the orbital laboratory. The Orbital Sciences Corp.’s Antares rocket lifted off to start its third resupply mission to the International Space Station, but suffered a catastrophic anomaly shortly after liftoff at 6:22 p.m. EDT. The Orbital Sciences team is executing its contingency procedures, securing the site and data, including all telemetry from the Antares launch vehicle and Cygnus spacecraft. Before launch the Orbital team was not tracking any issues. No injuries have been reported, and Orbital reports that all personnel around the Wallops Flight Facility launch site have been accounted for. NASA will continue to provide additional updates as it becomes available, as well as the earliest expected time for a news conference. From the earliest days of civilization, humans have always used art as a way to communicate, commemorate, and challenge. As civilization has evolved so has the sophistication of visual arts. From crude drawings on stone and primitive paper, to the masterpieces of the Renaissance, the magic of moving pictures and television, and now video recording capabilities that are unmatched. The beauty of art is that it connects with the viewer in a way that the written word can’t. A single motion, a paint stroke, a symbol can embody an event, a generation, even an entire period of history. So as civilization currently sits on the cutting edge of technology development, how can humans use art to communicate this progress? The Humans In Space Art Video challenge was designed to give college students and early career professionals an opportunity to answer this question. The video challenge invites students to submit a video no longer than 3 minutes that answers the question, how will space, science and technology benefit humanity? Video entries can incorporate all forms of creative communication (e.g. visual, musical, animation and dance). Entries must be submitted online by November 15, 2014. 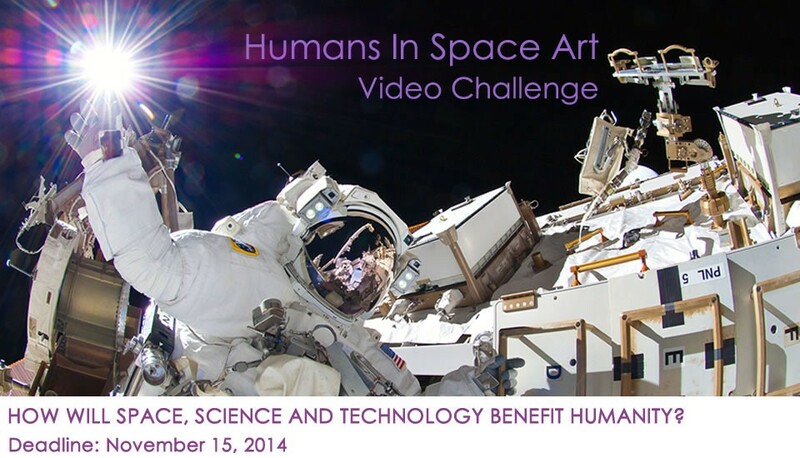 The video challenge is an outreach effort sponsored by CASIS, NASA’s International Space Station Program and the Humans in Space Art program. The International Space Station (ISS) is one of humankind’s greatest engineering feats and embodies the technological advancement and innovation of human civilization. The ISS inspired this year’s contest theme and the challenge allows contestants to creatively capture their thoughts about how current/future research and technology development will benefit and advance humanity. Currently, humans are living and working on the ISS. Thousands of hours have been dedicated to space research on the International Space Station with the purpose of gaining necessary insight for future space exploration initiatives as well as providing solutions and insights into Earth-based challenges. CASIS, the nonprofit organization that manages the U.S. National Laboratory on the ISS, has arranged for the first place winner of the video challenge to receive a monetary award and as a grand prize, the winning video will also take a trip into orbit on the space station!